Venezuela suffers without electricity, yet perseveres | Fight Back! Chicago, IL - The Venezuelan people continue to suffer terrorist attacks of a style previously unseen in the world. They are not plagued by car bombings, although opposition activists were planning such acts when they were apprehended by police last year - nor lynching in the streets, although that is exactly what happened to Maduro supporters on the barricades of the Guaidó-led opposition in the spring of 2017. Instead, Venezuela is the first country in history to suffer terrorist attacks on its very nervous system: the national electric grid, known in Venezuela as the SEN (National Electric System). On March 7, three coordinated attacks - a cyber-attack on the country’s largest hydroelectric dam, an electromagnetic attack on the SEN’s main secondary systems, and explosions at key substations - plunged Venezuela into days of darkness. It was soon clear that the attacks had been coordinated from the United States, and the far-right opposition led by Juan Guaidó has vocalized their support for any means available to bring down the legitimate government of Venezuela. The working masses see him as a traitor, who only serves imperialist interests and nothing more. Their hate for Guaidó was made clear when video emerged of his convoy being chased out of a poor barrio by hundreds of angry residents, condemning him as a “Yankee” as they tried to tip over his SUV. Since all efforts to make Guaidó president, each more ludicrous than the last, have failed, the opposition seeks to punish the Venezuelan people by bringing them to the brink of civil war. The power outages have effectively shut off the country’s sanitation systems, and many city residents now have to collect water from tanks directly. On March 31, a group of residents in Caracas were doing just that when they were attacked by a gang of far-right thugs, who tried to build a barricade around the tank and block access to it. While they were chased off by revolutionary colectivos, the brazen act was further evidence of the opposition’s aims with the blackout. Facing the gargantuan task of reactivating the electric grid of an entire country, the Maduro government has ensured that the people continue to be placed first. Not a single hospital has been closed during the crisis, with generators distributed to all of them (according to government spokesman Jorge Rodríguez, babies born at the hospitals during the blackout stand at 7715 and counting). All schools have been closed, but updates are given daily by Education Minister Aristóbulo Istúriz, who announced that the school year will extend into late July to ensure that no child misses out on their education. 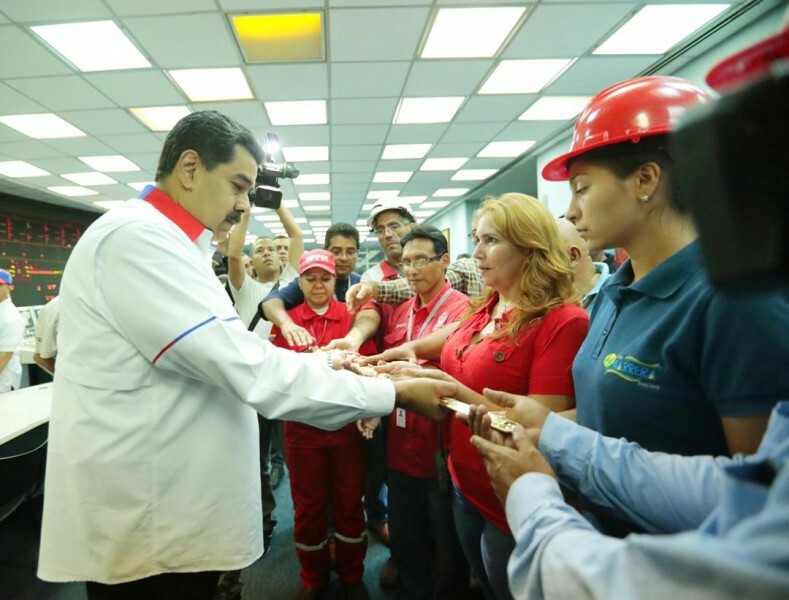 While it is easy for us in the United States to overlook our easy access to electricity, it was a hard-fought achievement of the Bolivarian Revolution to ensure that every Venezuelan could use this vital service. Before Chávez, many poor urban barrios had poor electrical service, while some rural communities had been forced to live without it. The Bolivarian government undertook the rapid expansion of the electrical grid, based primarily in hydroelectrics and funded by oil revenue. Today, Venezuelans have the highest electrical consumption per capita in Latin America with the cheapest consumer costs. This rapid expansion, on top of older infrastructure, means that the National Electric System is imperfect, and needed serious repairs before the terrorist attacks even occurred. So to ensure that this historic task is met, Maduro has appointed a new Minister of Electrical Energy, Igor Gavidia, who will take over Corpoelec and be the main point person in bringing the company back to full capacity. He will work with the new Minister of Science and Technology, Dr. Freddy Brito, who has been tasked with researching improvements to the SEN to protect it from future attacks of this nature. Vice President Delcy Rodríguez will oversee the entire project, the “Estado Mayor Eléctrico,” which includes Gavidia and Brito as well as every governor in the country. Immediately, Rodríguez called for a total restructuring and modernization of Corpoelec, and that the electrical workers take a fundamental role in the new company. It is they, after all, who have worked tirelessly to return power. The working class proves every day that it is the only class capable of leading Venezuela to a better future. Despite the burdens of the electric crisis, the Bolivarian Revolution moves forward. On April 2, the Constituent National Assembly (ANC) passed into law the Plan de la Patria 2019-2025, a 450-page plan that offers “the way forward to liberate our people, to build socialism.” The original draft was presented, debated and edited by over 3.5 million Venezuelans at over 30,000 assemblies, an incredibly democratic undertaking. The Venezuelan masses understand the risks involved with not surrendering to the United States. ANC Vice President Tania Díaz said as such when they voted to pass the Plan de la Patria, which she described as written by “a dignified people who have planted themselves against nothing less than the main imperialist power in the world, in order to reclaim their right to the future.” The right to the future, to socialism, is something that all of us in the Western hemisphere have. It is our only way forward — capitalism has nothing left to offer but exploitation and suffering to the point of environmental collapse. The future can only come through struggle, fierce and uncompromising, and the Venezuelan people’s struggle has revealed to us who will stand in our way. Let us double our efforts to throw the monopoly capitalists out of power, so that all of us can achieve what the Venezuelan people are working to build.